Pasteurization. What is it and why do we do it? The Food and Drug Administration (FDA) describes pasteurization as “a process that kills harmful bacteria by heating milk to a specific temperature for a set period of time”. More specifically, the milk is heated to a temperature between 145 and 150 degrees F for no less than half an hour and then is reduced to nothing lower than 55 degrees F. Of course the FDA sees this as a positive and necessary process, one that must be carried out in order to ensure the safety of the consumer and that, without it, milk would be a very dangerous product. The FDA and other proponents of pasteurization argue that its more important to consider the possible harmful pathogens that could make us sick than to consider the milk. The risk of disease, like tuberculosis, diphtheria, e-coli and salmonella is far too great, while keeping the milk houses and udders of the cows clean enough to avoid contamination is far too impossible. The FDA also claims that there are absolutely no nutritional differences between raw and pasteurized milk, and that this has been scientifically proven. But instead of backing up their statements with examples or studies, they only shared the opinions of other organizations that agree with them, like the AMA or CDC. So the FDA and most of the other government-run agencies, in America and abroad, are the main proponents of pasteurization. They believe it’s necessary in order to protect consumers, does not cause any harmful side effects like allergies or lactose intolerance, does not reduce it’s nutritional value, and that it actually saves lives. What I believe the proponents of pasteurization are missing in their argument is the full picture. Maybe they’re telling some truth, but they’re not telling the whole truth. And the ignorant consumer could be suffering because of it. I think one of the biggest pieces of misinformation from their story is the discussion about big-business dairy farms versus privately-owned, locally-produced dairy farms. The argument is that unpasteurized milk is too dangerous to drink … well of course it is if you’re confining the animals in awful conditions and forcing them to eat foods unnatural to their diet. How can you produce a healthy product from an unhealthy environment? Sally Fallon-Morell, a highly respected proponent of raw milk, participated in a raw milk debate last year at Harvard Food Law Society and said that she also does not believe raw milk is a good idea when sourcing it from the big-business dairies. There is no way to successfully produce it in these conditions, especially from cows that are confined and not eating the green grass that nature intended. It’s this green grass that gives raw milk such high vitamin and mineral content. Instead, though their unnatural soybean diet produces more milk and costs less for the farmer, it also contributes to the degradation of the animal, creating problems like mastitis, sterility, liver problems, and ultimately compromising the quality of the milk. Another half truth told by the FDA is that pasteurized milk doesn’t cause allergies or intolerances. They make this claim by concluding that the allergy-stimulating proteins are found in both pasteurized and raw milk, and therefore, if you’re allergic or intolerant to one, you’ll be allergic or intolerant to the other. But it’s what happens to the proteins, essential amino acids and enzymes during pasteurization that makes the difference. The proteins actually get warped, making them look like invaders to our immune system, causing our bodies to mount an attack in the form of an allergic reaction. So even though the protein is still present like the FDA tells us, it’s been damaged and can create harmful reactions. And all of the enzymes, such as lipase and lactase, are also destroyed during this process. It’s these live enzymes that enable our bodies to assimilate the nutrients and digest it properly and with ease. Without the lactase enzyme, many people are unable to digest lactose, the sugar molecules in milk. And if one can’t digest it, an intolerance develops. The FDA’s entire reason for pasteurizing milk is to protect the consumer from harmful pathogens. However, those on the other side of the fence believe that unadulterated milk is capable of accomplishing this all on it’s own. They contend that the naturally occurring, beneficial bacteria keep the bad ones (if they occur) in check. This good bacteria proliferates in our guts and keeps the pathogens at bay. Amazing how smart nature can be! In addition, the enzyme called lactoferrin has been approved by the FDA as an effective pathogen-killer in beef slaughter houses. This exact same enzyme is found in raw milk, along with other pathogen killers like xanthine oxidase, lactoperoxidase and lysozyme. But you guessed it, pasteurization completely destroys these elements. I found a compelling example that could support this claim. Mark McAfee, the CEO and founder of Organic Pastures and Dairy Company, reported that during the span of four years (2000-2004) “there were several listeria-related food recalls in California associated with pasteurized milk products and ice cream”. Interestingly enough, during this same time period, over 12 million servings of dairy products were produced by his company and not one case of any pathogenic problem was reported. Nor did any inspection carried out by the FDA or his company find any contamination (McAfee, 2004). Why is this? Maybe, just maybe, it was the available enzymes and good bacteria that kept his customers healthy and safe. One rat was given pasteurized milk and one raw. Though there were the same amounts of B6 in both milks, the one who drank the pasteurized kind developed hairless patches due to a Vitamin B6 deficiency, meaning only the rat who drank the raw kind could utilize it properly. Also the unpasteurized milk rats had shorter, less dense bones showing a calcium deficiency. And they were more irritable and biting. 4 studies done in Germany showed that raw milk protected against asthma and allergies, which coincides with the many parents that have contacted The Weston Price Foundation over the years to say the same thing regarding their children. Though the FDA likes to proclaim that pasteurization saves lives, not a single death has occurred because of raw milk since the 1980’s. Simultaneously, the CDC reported a total of over 3,000 foodborne deaths in 2011. So if raw milk isn’t contributing to these numbers, I would have to ask: What is causing these food-related deaths and are these foods being as tightly controlled as raw milk is? I completely understand that the production of quality milk can be a tricky business, especially when our populations are continuing to grow and we’re needing more and more of it. Even still, I think the answer lies in the local farmer. We must ask ourselves: How were we managing milk production before pasteurization and big-business farming? We’ve been living life a lot longer with raw milk rather than without it, and I think quite successfully to boot. Let’s get back to that time. 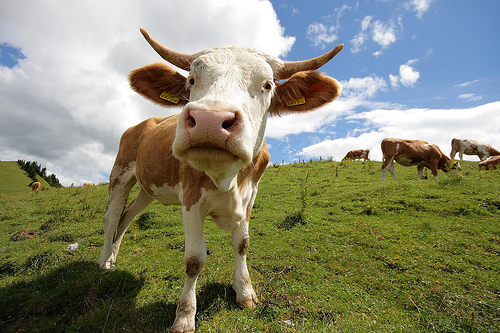 Let’s get back to pastured, happy cows and small-scale, local-producing farms. 1. Center For Disease Control. (June 21, 2013). CDC estimates of foodborne illnesses in the United States. Retrieved (July 8, 2013) from www.cdc.gov/foodborneburden/2011-foodborne-estimate. 2. Fallon, Sally & Enig, Mary Ph. D. (2001). Nourishing traditions: The cookbook that challenges politically correct nutrition and the diet dictocrats. Washington D.C.: New Trends Publishing, Inc.
3. Gumpert, David, Kassenborg, Heidi, Fallon-Morell, Sally & Pritzker, Fred. (February 16, 2012). Harvard Food Law Society raw milk debate. Retrieved (June 8, 2013) from www.youtube.com/watch?v=iLRdihFi6gw. 4. McAfee, Mark. (2004, modified 2013). The safety of raw milk. Retrieved (July 13, 2013) from http://www.realmilk.com/safety/safety-of-raw-milk/. 5. Shanahan, Catherine MD & Shanahan, Luke. (2009). Deep nutrition: Why your genes need traditional food. Lawai, HI: Big Box Books. 6. US Food & Drug Administration. (June 17, 2013). The dangers of raw milk: Unpasteurized milk can pose a serious health risk. Retrieved (July 10, 2013) from www.fda.gov/Food/ResourcesForYou/consumers/ucm079516.